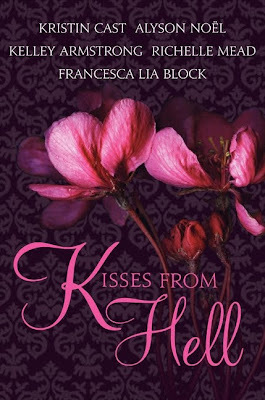 One of the things we haven't posted about yet, is the release of Kisses From Hell, an anthology that Richelle Mead is part of. Kisses From Hell is a collection of paranormal short stories. Other authors who are featured are Kristin Cast, Alyson Noel, Kelley Armstrong among others. I did a little research and it turns out that most of Sunshine is actually available for browsing on Harper Teen's website! There you can read five chapters (pages 1-55 of 67)! But then you'll really want to read the rest of it! Naturally, the book is available for purchase through all the major websites, such as Amazon, Borders, Barnes & Noble and The Book Depository. Like always, you can also choose to buy the book from University Bookstore and get it signed by Richelle herself. To locate the book on their website you have to search for the title, since there are many other authors listed for the book. Yesterday Harper Teen posted a trailer for the book on their twitter. I thought this was really fun! The best part about dating a vampire is - Pretty easy to make dinner for him, so long as no one misses your annoying neighbors. The worst part about dating a vampire is - It can get pretty crowded inside a coffin.